Our Vision and Values Statement was developed prior to move-in. It continues to be the core document that drives our life and actions as a community. CoHo is a cohousing community that is designed to encourage interactions between people and enrich our lives with the pleasure of cooperation and friendship. We care about the earth and are committed to environmentally sustainable practices and building techniques. Our multigenerational community welcomes diversity and values the input of each person. Coho is a community in which we share work, celebrations, laughter and tears. We support each other through the milestones of life. We sustain each other as we learn, raise children, and become wise elders. We strive to build a community where we can all belong for a lifetime. We strive to make our community as environmentally sustainable as possible, while still providing affordable housing. We weigh long-term environmental impacts as we decide how to create our village. We support each other in making sound day-to-day living choices that reduce our impact on the earth. We recycle, reuse, and share resources whenever possible. CoHo is committed to creating a diverse cohousing community. We embrace diversity in race, age, income level, sexual orientation, religious belief, ethnicity and physical ability. We honor our differences and support the uniqueness and growth of each person. We respect individual beliefs and encourage diverse traditions, celebrations and explorations of the spirit. A feeling of safety and trust is a key component of community. We foster this element within our community by respecting each other’s beliefs, accepting each other as individuals, and communicating openly and honestly. We build a safe and nurturing village for everyone, and especially for our children. We have governance structures and processes that maintain the social community and the physical spaces. We use the consensus decision-making process because we value every member’s participation and inherent wisdom. Consensus empowers each of us as individuals while we work toward furthering the community’s needs and goals. Communication and consensus decision-making skills are taught to and practiced by everyone in the community. We value both community and privacy and seek to have a balance between the two. We have shared spaces, such as the common house, in which we can participate in vegetarian common meals, celebrations, and activities. We also have the independent private space of our own homes. We value the riches that being part of the Corvallis community brings to us. We seek healthy interactions with our neighbors, with the Corvallis community and the larger state and global communities. We strive to be an inspirational resource locally, and a bridge to other communities in the world at large. CoHo includes both community and personal outdoor spaces. Gardens, natural spaces, landscaping, and architectural design all work together to create a unique sense of place. Working together in the garden fosters our connection to the earth, and our connection to each other. We work to create an aesthetically pleasing place to live. We recognize that we are a part of the interconnected web of life, so we strive to treat the natural community with responsibility and respect. We consider this community when making decisions. We create and maintain habitat for native plants and animals. To encourage connections between people and to reduce environmental impacts, we commit to de-emphasizing the automobile. CoHo is a pedestrian-oriented community. Parking and streets are on the periphery of the community. We encourage the use of alternative means of transportation by locating our community within walking distance of the bus line and within biking distance of downtown Corvallis. We believe that integrating our personal lives and livelihoods is beneficial, and bringing our work to our home is one step in achieving that. We include space for cottage industries, home offices and artistic endeavors where funding and building code allow. CoHo is not an income-sharing community. Our Purpose Statement was developed during our 2010 long-range planning process and was renewed during our 2014 long-range planning process. The first phrase is “arching over” the other statements because it is the “overarching” core of our purpose and provides the context for the rest of the statement. 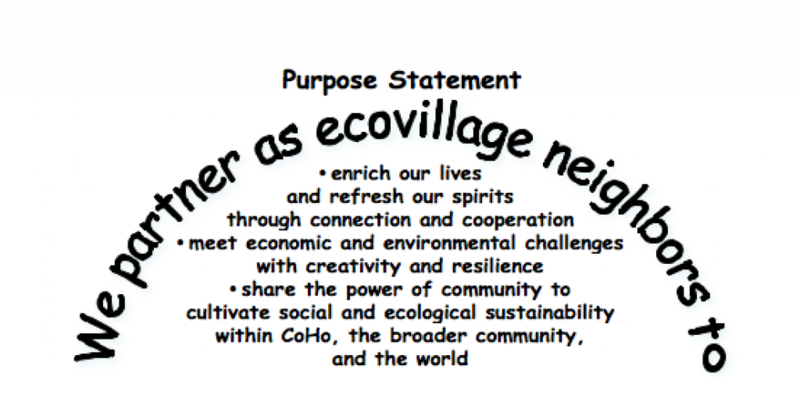 We are neighbors in an ecovillage, partnering together by consciously choosing to collaborate in a new way of living. The dual meaning of “partner” also captures two of the themes–social sustainability and task focus. In a social context, we have a deep connection and commitment to our “life partners.” In a work context, a “partnership” is created by individuals who collectively share their talents to create a successful joint venture. The next statements flow from this starting premise. We connect and form community. We work as a community to face common challenges. We share how community leads to sustainability and connects us with a broader circle of community. And the cycle continues. Social sustainability is the foundation of community. Through everyday connection and cooperation, we have deeper, fuller lives. We look to CoHo for joy, satisfaction, intersections (on the path and elsewhere). CoHo is home. Significant challenges impact our world. We band together as a community to create positive responses and generate the resilience to address change. Community is the key to living sustainably. We are energized and empowered within our own community and openly share our learning with ever-widening circles.